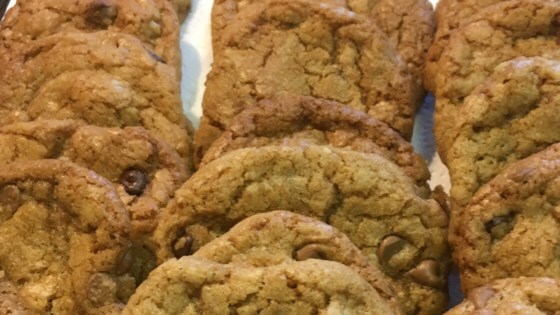 "These delicious chocolate chip cookies are almost no-fail. No matter what you do with it, they always seem to turn out. Even my ten year old daughter can make them and they still turn out. They are very rich and yummy." In a large mixing bowl, mash the butter with white sugar and brown sugar until the mixture is well combined. Beat in the eggs, one at a time, and stir in vanilla extract. Stir in the flour mixture, about 1 cup at a time, then mix in the chocolate chips. Drop the dough by rounded tablespoon onto baking sheets, about 2 inches apart. Bake in the preheated oven until golden brown, 12 to 15 minutes. Allow to cool for about 5 minutes on the baking sheets before removing cookies to finish cooling. the cookies came out tasting fishy, why? These cookies had a great taste, but for some reason the texture was more like a biscuit. fantastic recipe. they took a little longer than listed to cook, but I think that was my oven more than anything. These came out perfectly for someone who can't quite get the hang of baking (especially cookies), so this is definitely a well named recipe, No-Fail. Will be using this one again and again! Wonderful recipe! Followed the recipe exactly and the cookies turned out perfect! Its was good but not perfect. The outside was crunchy and the inside is chewy. Not bad. Holy hell! These are the best cookies in existence!